How to remove watermark from video? Take a look at Remove Logo Now! This program can help you to remove watermark from video in several clicks. Removing watermark from video can seem like a shady idea at first. The whole purpose of creating a watermark is preventing the image from being stolen and claimed as someone else’s. Of course it’s not great if you want to steal somebody’s art but this isn’t the only way you may want to remove a watermark. Imagine you have found one of the pictures you’d like to use but it contains your own watermark and the picture is quite old so you don’t have the non-watermarked copy on hand. This can certainly happen and that’s when you’d need something to get the watermark off. Or, you can have the watermark on one of your videos as well that you’d like to use somewhere else without watermarks, for example, make a video clip as a gift for your relatives or friends. This qualifies for the same process of deleting watermarks and it’s perfectly normal, the watermark can be your own just as well. Logos and watermarks in video files can be annoying, indeed. It’s not that easy because it’s not a static photo which you can open in Photoshop and try to erase the logo manually. Video is not static, the frames are moving so removing the logos manually is a difficult task that very few users would like to experience. Imagine cutting the video by frames and trying to erase the watermark on each of them. It will take a terrible amount of time and effort. However, there will be absolutely no problems to remove watermark from video files if you download a special tool known as logo remover. The tool does the job automatically by applying the algorithms that are almost impossible to recreate manually. These algorithms analyze the video file, the backgrounds of each frame and can actually remove the logos with minimal damage and sometimes it can even be completely unnoticeable. There’s a tool that can help you with your task of removing logos from video. Remove Logo Now! By SoftOrbits automatically analyzes the video stream, locates and removes static overlays, including logos, subtitles, and watermarks. Thanks to the unique inpainting algorithm, Remove Logo Now! removes objects carefully, leaving almost no visible traces. Often you can find timestamps or Rec logos on videos, for example those you’ve ripped from VHS. It’s common to have them on old footage from the 80s and 90s. It’s easy to remove those if they’re too annoying using Remove Logo Now. Remove Logo Now! features a special AI algorithm, it analyzes adjacent frames to patch frame overlays, thus leaving no visible traces. There will most likely be no traces left but still, the videos can be quite different so it’s recommended to try the program out first. Download the full or the trial version of Remove Logo Now! from our website. The copy is virus and malware free, is lightweight and installs itself within a minute. Install the program following the instructions of the setup wizard. Launch the program from the Start menu or the desktop icon, if you have chosen to create one during the setup. Use the 'Add files' button to select input files. The Remove Logo Now! tool will automatically delete the logo from all of the files provided that the logo is the same. It’s possible because the algorithms analyze the picture thoroughly and pick the right pixels to delete. Use the 'Find Logo' function if you want the tool to automatically identify the watermark in the video file. This option is compatible with the majority of known video formats. It can highlight the logo without you having to highlight it manually. It may not always work but we recommend checking it out before manual selection. Use the manual editing tool if you are not satisfied with the results yielded by 'Find Logo'. You can use the Marker tool, add or remove pixels and use Rectangular marquee. This way you can select each pixel and leave out all the rest that you don’t need. Manual selection can prove to be more accurate sometimes but of course it hugely depends on the file. You can also clear the selection if there’s a mistake and start again. Run the removal after you’ve finished selecting the logo. Remove Logo Now! features a conversion option as well. This means that once you remove the logotype, you can either save the video file in its input format or convert it to another format. Everything can be done on-the-go, without having to exit the program. 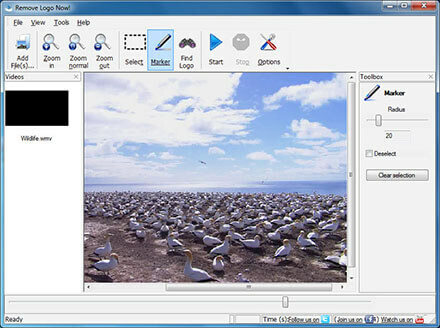 Video formats supported by the program include AVI, MOV, M1V, MP2, SVCD, FLV, MP4, M2V, DVD, SWF, 3GP, MKV, WMV, and RM10. The output can be saved to the folder of your choice. You can edit the settings of audio and video streams, bitrates and frame rates in the output file, and much more! You can also zoom in and zoom out the videos and select the time intervals that you need the program to remove watermarks from. Check out other useful tools that are available in the program, you won’t be disappointed! What else can you use Remove Logo Now for? Removing subtitles that are embedded, for example if your copy is hardsubbed and you’d like to use subtitles in another language, or if the current subtitles aren’t very precise. How annoying it is when the subtitles aren’t timed well, for example, and they are hardwired into the video file. It’s very handy to remove the subs then and use the file just like you wanted to. Removing channel logos, for example if you’ve downloaded a broadcast but there’s an annoying channel logo and you’d like to watch without it constantly hanging in the corner and taking too much space. Removing transparent watermarks of any type and source, these often appear on different types of videos and make it sometimes difficult to even see what’s happening as they can take up half the screen. Removing dates and timestamps, as mentioned before, it’s quite common on older videos so once you find your prom recording and feel the urge to clean it up a little, go ahead, the program will work nicely. Take a look at Remove Logo Now! This program can help you to remove watermark from video in several clicks and forget about the hassle of trying to remove the logo without its help. It can be tiring, frustrating and maybe even impossible. So if we had just one shot at removing an irritating watermark, we’d be picking Remove Logo Now and so should you! Pick the automated solution instead and be happy! Trust Remove Logo Now with your videos and the results will no doubt be satisfying.